Lavender needs pruning at least once a year to keep in good heart. The best time to do this is after flowering, cutting the bush back by approximately one-third if it is an adult bush. Cut the bush into a mushroom or flat shape ; be sure not to cut away the lower branches too severely - just trim them to look neat . Lavender also responds best to a pruning after the main flowering, especially if you haven’t been picking to any great extent. If you’re picking the flowers regularly and cutting the stem with some leaf at the same time you won’t have to prune as much. Never cut into old wood. 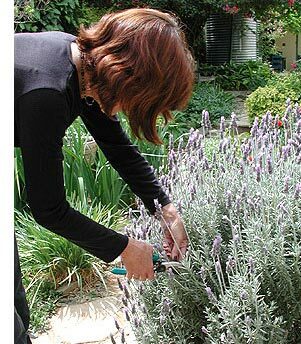 Lavender is likely to die if drastically pruned. If a bush of three or four years old has fallen open in the centre, try earthing it up, piling soil over the bare woody stems at the centre. They may produce new shoots, but replacement is usually the better option. Lavenders may need to be replaced every four years or thereabouts. If well looked after they can last for 7 to 10 years.